The vital is highly disturbed having nothing but fear. In extreme difficult situations, one becomes panicky and terror-stricken losing patience, running helter – shelter and becomes mentally and physically inert. 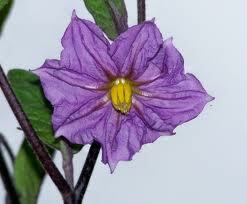 Small lavender blue cup-shaped BRINJAL FLOWER (Solanum melongena) helps us to remain calm and composed in any extreme situations. It balances the vital, and normalizes the Hara chakra.